Sketching and cutting out hearts. Warm and Cool color contrast. Working with chalk and powdered tempera paint. Blending and working with chalk pastel. I started our discussion with the color wheel and how I correlate warm and cool colors. Then we talked about how using the opposite colors makes them pop on the paper. 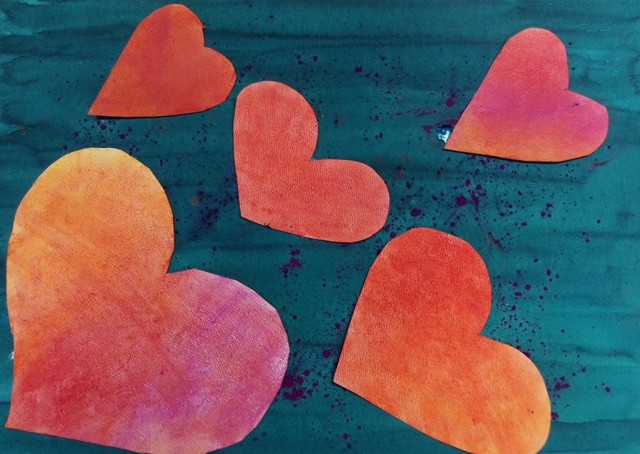 I passed out watercolor paper, pencils, scissors and erasers to sketch and cut out hearts. We varied our shapes and sizes to make the overall appearance of our piece. We laid them out to make sure they fit on our background then we set aside to work on background. We then chose our background color and painted that. Then we added another same warm or cool color by sprinkling powdered tempera paint on wet background. Set aside background to work on the hearts. 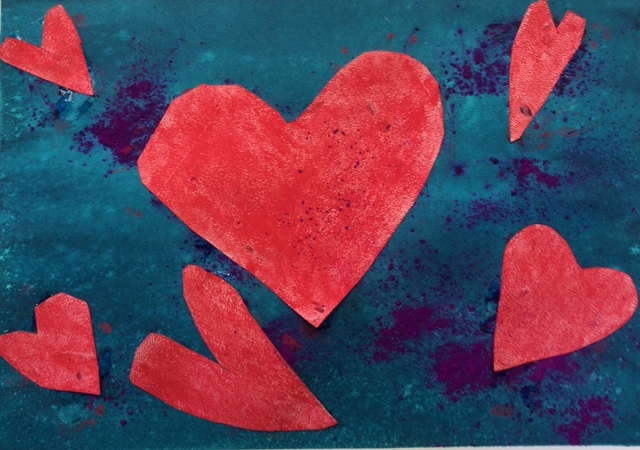 We then took chalk pastel to color and blend our hearts with opposite (warm or cool) color of our background. Then glue them down remove tape and sign. These came out amazing!